The summer heat brings out the snacker in me. I'm definitely a snacker where I like to eat small meals and portions throughout the day. And if I were to choose my ultimate favorite snack, it would be cheese and crackers hands down. Often times I'll reach for a wedge of various cheeses to enjoy but every now and then, I enjoying making cheese balls. The latest one I made was this Cheddar Ranch Cheese Ball. Cheddar and blue cheese are mixed with cream cheese and seasoned with ranch dressing before being rolled in almond slices. It's creamy, crunchy and bursting with flavor! For most cheese balls I make, they all include cream cheese as a binder and blank slate for flavors to build on. In this case, I used shredded sharp cheddar cheese, crumbled blue cheese, and a dry Ranch dressing mix. What's great about this combination is that you could even elevate it further with a few dashes of hot sauce for a Buffalo-style Cheddar Ranch flavor, reminiscent of Buffalo Chicken. And while you're at it, mix in some shredded chicken to completely change the recipe to a buffalo chicken cheese ball! In a large bowl, mix together cream cheese, Cheddar cheese, and dressing mix. Form into one large ball or two smaller balls. Roll in almond slices to coat surface. Refrigerate for at least 2 hours, or overnight. Serve with crackers and/or crudités. 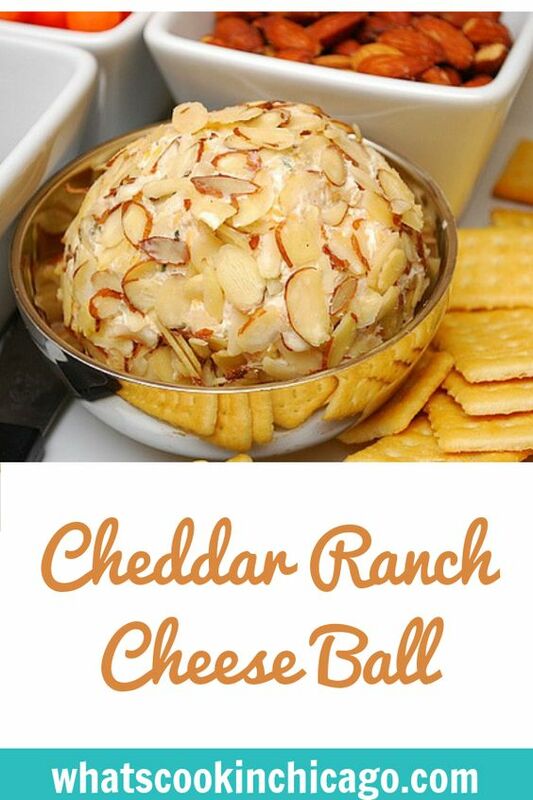 My mom always makes a cheeseball like this but without the ranch seasonings. This one sounds great - the almonds are very prety! 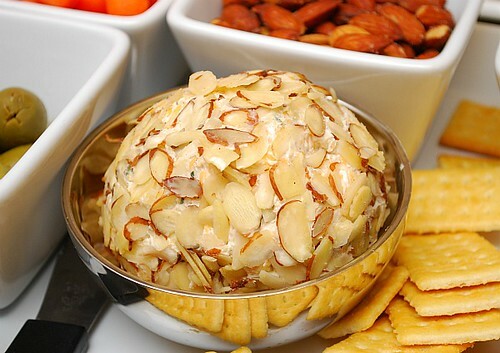 I have made one similar to this but without blue cheese and pecans instead of almonds. I need to make one soon since it has been way too long.